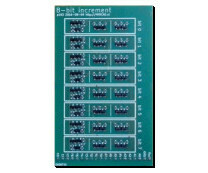 The address-increment unit takes as input a 16-bit address, and has as output the address incremented by one. Therefore, this module basically adds 2 numbers, one of these numbers being a constant "1". Like the multiplexer discussed earlier, this is a pure combinational block (its output only depends on its input, not on its input-history). 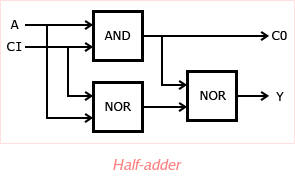 A combined block known as a "half adder" is introduced, using a somewhat different explanation than commonly seen. The complete address-increment unit can then be constructed by placing a number of these adders in cascade. In the previous section about binary numbers, binary arithmetic was shown to be very similar to decimal arithmetic. Columns are added from right to left, just like with a pen-and-paper decimal addition. The sum is called Y, a common output-indicator for logical blocks. The address-increment unit does eactly this: add a number A (address) and a constant "1". It would be convenient to implement this behaviour using an array of identical "1 bit adding" blocks. However, the bits forming the constant "1" are an inconvenience: the rightmost bit in this number is binary "1", and all other bits are "0". One possible implementation of such a block is shown here. In practice, because of the particular way transistors are used within the Qibec CPU ("RTL" - Resistor-Transistor Logic) , NOR- and NAND-gates are more convenient to construct than AND- and OR-gates. However, recall that a NAND-gate is basically an AND-gate followed by a NOT-gate. Likewise, an AND-gate can be constructed by using a NAND-gate with a NOT-gate behind it. 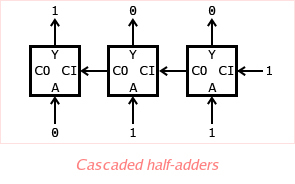 As with the N-bit multiplexer, creating an N-bit increment-unit out of 1-bit adders becomes trivial, by placing N 1-bit adders in cascade. The CO-output of each stage is connected to the CI-input of the next stage. The CO-output of the last stage (most significant bit) is simply discarded, and the CI-input of the first stage is set to a fixed "1".